Banking Royal Commission: What Does It Mean for the Housing Market? The royal commission final report, handed down on Monday, will not adversely affect the housing market or force an unnecessary credit squeeze. Despite some alarmist messaging about the royal commission triggering a housing bust, Kenneth Hayne’s final report into the finance sector did not recommend the banks further tighten lending standards. Commissioner Hayne acknowledged the steps taken by the banks to strengthen their home lending practices and to reduce their reliance on the household expenditure measure (HEM). “I consider that the steps that I have referred to – steps taken by banks to strengthen their home lending practices and to reduce their reliance on the HEM – are being taken with a view to improving compliance with the responsible lending provisions of the National Consumer Credit Protection Act,” Hayne wrote in his report. Hayne echoed recent comments by Westpac chief executive Brian Hartzer that the royal commission had not made banks scared to lend. Hayne refers to the Treasury’s submission in the interim report that “there is little evidence to suggest that the recent tightening in credit standards, including through APRA’s prudential measures or the actions taken by ASIC [h]as materially affected the overall availability of credit”. In the lead up to the report’s release, Treasurer Josh Frydenberg had called access to finance “the lifeblood of the economy”. 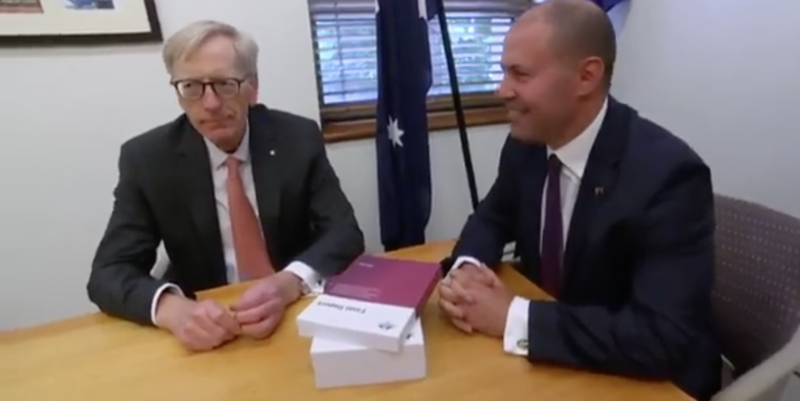 Commissioner Kenneth Hayne giving Treasurer Josh Frydenberg the final report from the Banking Royal Commission on Friday. The 951-page final report has laid the blame for the misconduct squarely on senior banking executives. “There can be no doubt that the primary responsibility for misconduct in the financial services industry lies with the entities concerned and those who managed and controlled those entities, their boards and senior management,” the report said. The report has also referred several institutions to ASIC for possible criminal charges, although at this stage it has declined to name names. The final report recommends a new regulatory body for ASIC and APRA due to failure to appropriately oversee the financial industry. Mortgage brokers face a commission overhaul, with a series of recommendations, have focused on businesses such as insurance companies, mortgage brokers, financial advisers, and super funds. “From today, the banking sector must change and change forever,” Treasurer Josh Frydenberg said in his address. “My message to the financial sector today is that this misconduct must end. And you must put the interests of consumers first. Consumers must be treated honestly and fairly. Out-of-control greed among banks and weak corporate cops are to blame for the nation’s financial scandals. “In Commissioner Hayne's own words, ‘there can be no doubt that the primary responsibility for misconduct in the financial services industry lies with the entities concerned and their boards and their senior management’,” Frydenberg said. The federal government has said it will adopt 75 of the 76 recommendations but has not immediately accepted the call for upfront fees paid by banks to mortgage brokers to be banned, arguing it would decrease competition. Labor said it will implement all recommendations in full if elected.